Leaked letter: Cameron wrote to his Oxfordshire council, questioning cuts to frontline services. Why didn't he just write to Osborne?! David Cameron has become embroiled in a bizarre row with his local council after he complained about cuts to frontline services that it blames on the government slashing its budget. The Prime Minister wrote to Oxfordshire County Council leader Ian Hudspeth to say he is "disappointed" at proposed "cuts to frontline services, from elderly day centres, to libraries, to museums". Mr Cameron, who is the MP for Oxfordshire's Witney constituency, warned in a letter leaked to the local newspaper that the council should "move cautiously in setting out its budget plans" and that the government had not yet announced how much the council would receive in central government grants next year. He also advised that the council should sell off excess council property to help fund vital services. 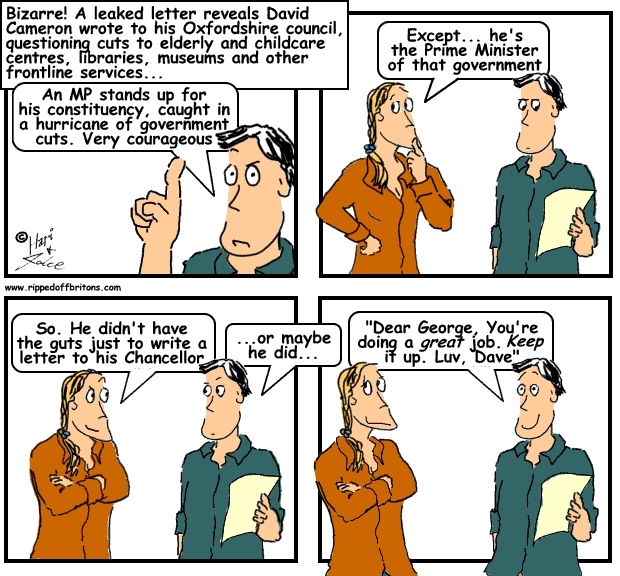 But Mr Hudspeth replied to remind the PM that he "worked hard to assist you in achieving a Conservative majority" and suggested that the cuts were needed as a result of government funding being slashed. Mr Cameron said that while there had been a "slight fall" in government grants much of the apparent cut-back was due to a re-allocation of school funding from local education authorities to academies. He said the council's spending power had actually increased by 1.3 per cent. Mr Hudspeth hit back by saying he would not describe the government's grant dropping from £194million in 2009/10 to just £122million this year as a "slight fall". The council leader said that the local authority had also reduced its staffing levels by 3,000 people since 2010. He added that Mr Cameron's suggestion to sell off land would be "neither legal, nor sustainable in the long-term since they are one-off receipts".